Earlier that night (the night before, so technically the day before) I had gotten a taxi ride from my host house up in Park City Utah to the Salt Lake City airport at 9pm. I checked my bike in and watched some movies on my laptop while the plane was delayed by an hour. We took off at 12:40 am. It was a four and a half hour plane ride. I had the aisle seat, even though I’m pretty sure I reserved a window seat. I dozed but never quite got to the point of sleeping since the flight attendants kept bumping my arm, leg, foot, and head with every pass of their metal cart. I had planned well for the noise though. I had ear plugs AND my carpentry earmuffs. Plus I had taken some tylenol sleeping pills. This all helped block out the screaming baby right next to me. Anyways, we flew to JFK. Then later to Burlington VT (that stands for Vermont, not Vermen, like I originally thought). My teammate, Alan, picked me up. We also picked up Spencer and our friend Trisha, who had just gotten off a plane as well. We drove to our host house way out in the woods here and then went to eat sandwiches and swim in the river. This is a really poor post so far. I can’t really think and all I’m doing is listing events that have occurred recently. This is where most people go wrong in their race reports/writing about pretty much everything else also. No one wants to hear a boring timeline of events. Like in history. No one wants to learn a bunch of dumb dates of when “so and so” started some boring (and pointless) war 290 years ago. They want to hear about a cool, funny story that happened to “so and so” when he was drawing up the war plans. There’s been a million wars throughout history. That’s a fact, there have been exactly 1 million wars, look it up on Wikipedia if you don’t believe me. And if it says otherwise, you shouldn’t believe everything you read on Wikipedia. Anyways, people don’t want to hear about the date of the war, the reasons it started, which are all the same anyways, or the countries involved. They want to hear about how “so and so” accidentaly stubbed his toe on a table when he was plotting his war plans and how he knocked over a big plate of chicken on the dinning hall floor. The castle dogs ran over and ate the chicken and the combination of stubbing his toe and the dogs eating his chicken made him so mad he burst a blood vessel in his eye. Later that night when he got together with his friends to just go have a good time out on the town, they all made fun of him for hours because they thought he was really really high but he wasn’t. He had just burst a blood vessel but they wouldn’t believe him!! Anyways, that would be a much better story to learn about in history class than all the text book crap they teach. I started the race with high cortisol levels since my teammate Chris Wingfield drove off with my aero helmet and didn’t get it back to me until about 3 minutes before I started. It was a 9.5K TT. It was a hilly course and I blasted through the first 3K climb, almost catching my 30 second guy right off the bat, but didn’t quite close the gap until a few K later. I ended up taking 10th out of a darn good field of 100 cat 1’s and pros. Ted King took 1st. That’s it for the race report. Just so you know, our host house is almost directly located ON the TT course. We all either rode our bikes to the TT start or some of us drove there but rode home. This meant all the team’s cars were strewn about all over the place. Later in the day after the race was over and we had a chance to go home and eat, Lang, Spencer, and I drove the entire length of the final day’s RR course. A very wise move since the final day had some massively steep climbs at the end. On our way back to the house, Lang dropped me off near the start of the TT course so that I could drive Alan Adam’s car back to our house. As they dropped me off, I told Lang to wait for me since I wasn’t quite sure how to get back home. He said OK, then immediately drove off (squealing the tires), both he and Spencer no doubt laughing hysterically as they sped away from me as I stood in the middle of the road. I crossed the street to the gravel pull-out where there were a few cars parked. I took a pee behind a tree. I found a key on the tire of Alan’s car, right where I was told it would be. I got in and began driving home, concentrating on not getting lost. Once I was on track, the drive home was just a short few miles that mainly followed the TT course. As I was driving along, I noticed a lot of strange odds and ends in the front dash of the car. When I had first looked in the back seat before I found the key and got in the car, I had seen a cliff bar and a pump, some shoes and a few other bike-related items. Typical bike racing stuff. Now, as I looked in the front seat area of the car I noticed a bunch of stuff that didn’t seem like it would belong to Alan. Alan is a pretty neat and organized guy, and the front of the car was littered with dozens of pens and pencils, change, pieces of paper, other odds and ends, and a pair of old-man reading glasses. “Hmmm. A lot of crap up here for a rental car that we’ve only had for 2 days,” I thought. I continued on driving. You know where the story’s going from here. I grew more and more paranoid that I had mistakenly gotten into and was currently driving a stranger’s car. My palms began sweating, my heart rate increased a bit, my cortisol levels raised. My eyes were glued to the rear view mirror for a masters rider to pop his head out of his aero tuck and start shaking his fist at me as he realized his stolen car had just passed him. But I kept going, not quite convinced yet that I was driving some random person’s car. No way. That sort of thing doesn’t happen in real life. That only happens to the idiot friend in comedic movies. Plus, I simply didn’t want to believe it. If I did believe it that would mean I’d have to drive all the way back to the gravel pull-out, where I would most likely find out that I was indeed in the correct car and then I would have to start the 20-minute drive all over again. Not worth it. Just keep driving and everything will turn out just fine. I got to the long gravel road that our house was on and four of my teammates (Alan Schmitz, Alan Adams, Robin, and Winger) approached from the other direction in Alan Schmitz’s car. I rolled the window down as we got closer. They were on the way to the grocery store. They saw me and slowed to a stop. From here on I was in a bit of a panic. I flipped the car around and started my paranoid drive back to the gravel pull out. My teammates were in front of me, not really understanding what was happening and in somewhat of a laughing hysteria. They yelled back to me to ask if I was joking. I gave a very serious shake of the head “NO.” They continued their laughing. I continued thinking about what I was going to do if the cops were at the scene of the crime. Unfortunately the driving was very very slow, since we were still on the TT course and many of the other category riders were either still racing or riding back to the start point. Alan and the other’s in the car decided to go back to the gravel parking area with me instead of the grocery store, just in case the cops had shown up and I needed some backing up. And I bet they also wanted to see me get hand cuffed. My eyes were now glued to the rear view mirror looking for flashing red and blue lights. After the longest 20 minutes of the day, which any other day would have been during the time trial, I finally got back to the gravel pull out. No one was there. Not even the owner of the car. He must have still been racing. I parked in the same spot the car had been, got out in a hurry, made sure not to leave any of my stuff in there, and wrote a quick note explaining what had happened. It started like this: “Hi, funny story…(I hope)…” I did not sign my name. Alan Adam’s car (the car I was supposed to pick up) was sitting just to the right of where the car I had stolen had been parked. The car I had gotten into was a small 1990-something green sedan. The correct car was a new, large, grey SUV. 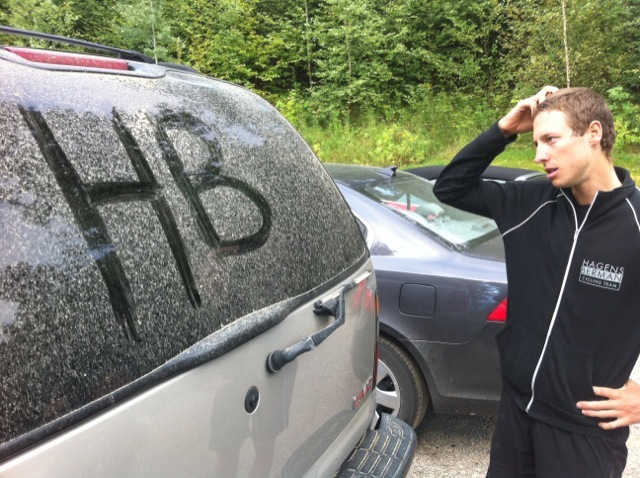 The initials of our team “HB” was written in large capitals in the dust of the back windshield. I had spent the entire previous day driving around in this car. Whoops. Alan and I got into his SUV and we all drove off, with me sighing many sighs of relief as my cortisol levels slowly declined. I came away from the situation having learned a valuable lesson–If I ever become a crack-addict, at least I know where I can easily find my crack money: stealing cars at bike races.